Each year the Royal Society pairing scheme pairs 30 research scientists with UK parliamentarians and civil servants. By spending time together in Westminster and the researcher’s lab, participants learn about each other’s work and gain a greater insight into how research findings can help inform policy making. Last year, Carole Perry, Professor of bioinorganic and materials chemistry at Nottingham Trent University was paired with Lilian Greenwood, Shadow Transport Minister and MP for Nottingham South. After this ‘Week in Westminster’, Lilian visited Carole in the Chemistry Department at Nottingham Trent University. Carole arranged meetings for her to get an insight into work underway at the University including a panel meeting with around 12 final year chemistry masters’ level students who spoke with Lilian about their time at the university, their career aspirations and what they like about living and studying in Nottingham. 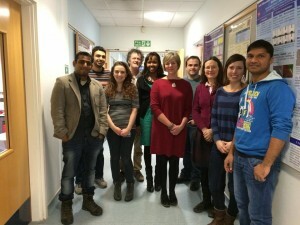 Lilian also met with a group of second year students working on individual analytical chemistry projects and with Carole’s research students to learn more about Carole’s research and her work at the university. Carole spent a further busy day shadowing Lilian in her constituency in Nottingham. Carole and Lilian visited a local primary school that is supporting the education of children as young as two from the most disadvantaged families in Nottingham and then went to an unveiling of carved wooden story poles celebrating the history of the Meadows, an area of Nottingham. Carole sat in on Lilian’s surgery meeting with constituents, attended a local meeting on housing for people with multiple disabilities and attended the opening of a new centre for immigrants. If you would like the opportunity to see policymaking in practice in Westminster and show policymakers the work underway in your university, applications for the Royal Society pairing scheme are now open until Sunday 24 May. If you would like to find out more about the scheme, who is eligible and how to apply please visit the Royal Society website or email Rachael Mann.